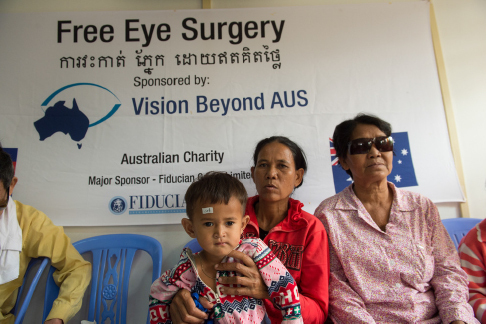 Chi Lina was born blind with cataracts in both eyes and had no hope of ever seeing until Vision Beyond Aus surgeons in Battambang, Cambodia, operated for no charge. Chi’s father abandoned her mother when she was 6 months’ pregnant, leaving her to scratch a living by making souvenirs and selling them to merchants in her village. As Chi grew, she could not walk safely or play with her friends. But, through the work of Vision Beyond Aus, Chi was brought to the eye centre in Battambang where surgeons operated on both eyes under general anaesthetic – at no cost to her mother. Chi can now see, begin to learn to read and is on her way out of a life of poverty into one of opportunity. 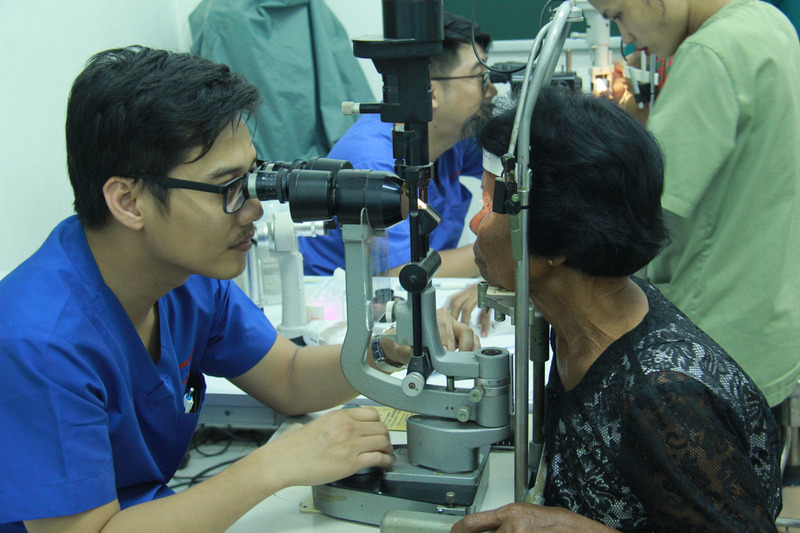 Khim, 73, developed an age-related cataract in each eye. She experienced blurry vision, tearing, and light sensitivity. Khim is a mother of six; she has three daughters and three sons. She has 12 grandchildren. She used to be a rice farmer but has been unable to work for the past year due to her declining vision. She likes to listen to monks pray on the radio and look after her grandchildren in her free time. Khim and her niece traveled for three hours to come to CSC from the Kandal Province in Cambodia. Khim’s family was concerned that her diminished vision was affecting her quality of life and that she will slowly go blind. She has been unable to support her family and be independent due to her poor vision. Click here for Khim’s full story. Click here for Ravuth’s full story. 7 year old G Tunna, a tribal boy from the blind school was brought with complaints of defective vision since early childhood. He hails from a family of 3 other siblings. His parents are labourers and he was put into a Blind School four years ago. On examination here he was found to have congenital cataracts in both eyes with nystagmus. After assessing him pre operatively he was posted for surgery under general anaesthesia. Both cataracts were operated upon on the same day and IOL’s implanted with no cost to his parents. Post operatively it was astonishing to see his surprise on seeing his parents for the first time. The joy of this lad is beyond words to describe. The post op picture says it all. The parents and School are grateful to our hospital and the donors for what they say are the miracle of sight for this child. 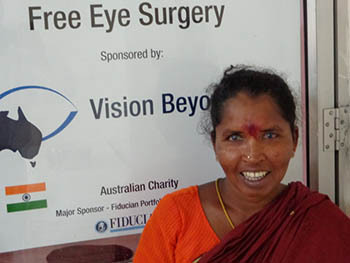 Adi Laxmi is a woman who lives in Southern India, she was desperately poor and totally blind from macular dystrophy of the cornea in both eyes. A face of confusion and fear has now, after two corneal transplants carried out by Dr Sunil Thangaragh and funded by Vision Beyond AUS (VBA), turned to joy. She has been able to go out and find work to support her disabled husband and her daughter has been able to return to school. Her self esteem has reappeared and life is worth living again. As a family, their lives are transformed. 14 month old Jeypal Relli was brought to our hospital as his parents noticed a white opacity in his left eye for the past 3 weeks. They had consulted other Ophthalmologists, but were not satisfied with their advice. On hearing about our Hospital from fellow villagers they approached us for consultation. We explained to the parents that the child had congenital cataracts in both eyes although in varying stages. We further advised that the baby had to undergo a complicated surgery and then rehabilitation for the same. They agreed to get the left eye operated upon and only after that the right eye. The child underwent surgery on 28th Feb 2014 and the post op picture was taken the very next day (1st March 2014). One can see the absolute joy on both the Mother’s and child’s face.